At some point in their careers, many great Architects have looked around at their world and wondered why it can’t be better. 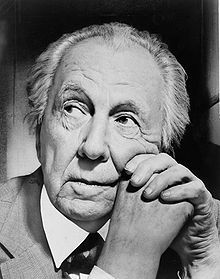 During the depth of the depression in the 1930’s, Frank Lloyd Wright designed Usonian homes for the common man. Mostly one story L-shaped plans around courtyards, they had no attics or basements. A long cantilevered roof that Wright called a “carport” protected the family’s car. Deep overhangs provided passive solar heating and natural cooling. They had radiant floor heating and strong indoor/outdoor visual connections. Over 100 of these modest, organic, forerunner of the 1950’s ranch homes were built. Fusion designers are Architects and Engineers that care about how people live today. They are not constrained by industry traditions. They design for the present and the future. They are against monotony and sprawl. They are for family, community and green design. This entry was posted in Fusion and tagged Frank Lloyd Wright, Fusion, Usonian. Bookmark the permalink.